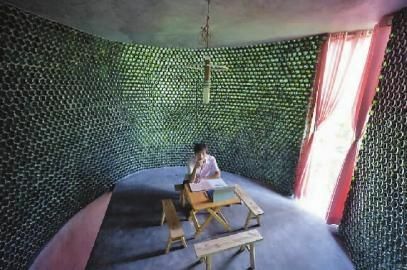 Li Rongjun enjoys the sunshine in his office, which was built with 8,500 beer bottles. "I want to build an office which combines artistic beauty with pragmatism," said Li Rongjun, who graduated from the Inner Mongolia University of Science & Technology this year. The top level of the two-story structure is made of 8,500 beer bottles in 40 layers, while the bottom floor is built with mud and brick. Each of the the 29 square meter structure's stories is 2.8 meters high. "It is prettier at night. When the lights go on, the room looks radiant and the green light reaches as far as the road," neighbor Li Yan said. The beer-bottle structure could be considered an artistic creation but not a product to be marketed, according to an expert. "The top level has no load bearing wall and the weight the beer bottles could carry is limited, thus the structure may collapse," said Tang Zhe, an architect with a local design company in Chongqing.